Total Cost Involved and Jim Ries, owner of Classic Performance Parts, are in cahoots to build the sleekest street-driven '70 Nova. 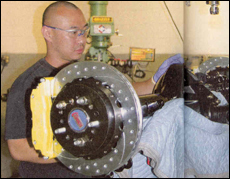 Jim provided the Nova and TCI provided its R&D team's collective talent in the construction of their own brand of a four-link rear end specifically for the third-generation Nova. Like any good manufacturer, TCI offers its rear end kit with standard parts and optional upgrades as well. Before we move on, let's take a look at what they are. The standard rear end in this kit is an all-new 58 1j2-inch rear with new 31- spline axles from Currie Enterprises that can accommodate some wickedly wide wheels. The optional gearing is as, follows: 3.00. 3.25, 3.50, 3.73, 3.89, 4.11, and 4.56. Posi-traction is also another available option. A Panhard bar is supplied when a 9-inch inch rear is used, and a track bar is supplied when a Chevy rear is used. Brakes range from 12- and 13-inch Wilwood drilled and slotted zinc-washed rotors with optional painted or polished calipers. Standard GM 12-inch! smooth rotor and GM calipers are also available. Drum brakes and the backing plates are another possibility. All brake kits have an internal parking brake assembly similar to the Corvette's . Four-link options include billet adjustable coilovers (manufactured by TCI) or polishe billet coilovers, chrome bars with chrome coilovers, polished stainless bars with chrome shocks, or an antisway bar (also with chrome option). If coilovers are not desired, ShockWave airbags from Air Ride Technologies can be ordered. 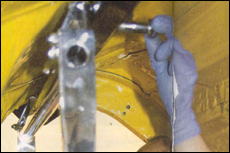 Our goal for this article is not to Cover every nut and bolt of the rear clip install. We really wanted to take It out to the endless blacktop at the California Speedway in Fontana, California, and thump it till it cried for mercy. The end goal is not the install itself, but rather does it work? Can it handle, and what are the results? 1. Out with the old. It served its purpose well for many years, but the old junk under the trunk is gone. 2. Prior to installing the TCI rear suspension, a few areas of the unibody framerails will need to be ground down. It's not major surgery, just necessary prep work. 3. Smoothed and cleaned on both sides. 4. 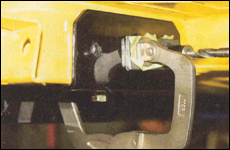 A l/2-inch notch will need to be cleared in order for the four-link bracket to mount to the vehicle. 5. Again, it's not major surgery, just necessary details. 6. Now that it's cleared, the bracket install can proceed. 7. Before the new crossmember can be bolted in the framerails, a few more brackets need shaving. 8. These should be the last of the cuts and grinds we need to make. Put the grinder away its time for the drills. 9. A 5/16-inch drill bit is put to good use. 10. The Grade 8 bolts are all in the kit. Once it's drilled, we bolted down the bare metal crossmember. After the initial test-fit, the crossmember and brackets will be uninstalled and sent to the powdercoater. 11. The holes drilled into the floor for the brackets come up through the trunk floor. TCI has provided the reinforcement brackets and bolts in the kit. 12. These reinforcement brackets will need to be painted or powdercoated too. 13. TCI provides a 3/8-inch drill guide in the kit for the cross member. Using the drill guide will give level and parallel holes so everything will align properly. 14. Now that all the cutting and drilling is out of the way, it's a simple matter of installing the rest of the suspension. First comes the splined sway bar. 15. Then come the coilovers. 16. The four-links, sway bar, and coilovers are in place. The rear end is installed next. 17. A few hours later the entire rear is set up and nearly ready. 18. From the inside out, here is what it all looks like. 19. The Wilwood four-piston calipers in the back and six-piston in the front with 13-inch rotors should give this Nova some serious grip when the pedal is pushed to the floor. 20. Before this Nova rolls to the track, a set of sticky flypaper Toyo T1R (rear 275/40/18 front 235/40/18) tires and 18x7 Wheel Vintique Lakester wheels were added to all four corners. The third-gen Novas are notorious for their limited rear wheel and tire sizes. In future issues of SUPER CHEVY we will cover the build of this car and how the wheel size issue was solved. 21. The moment of truth. Yes, this really is the same car. We tested this Nova against the Nova 228 that ran in our September '07 issue. In all its aged OE glory, these are the numbers we managed to squeeze from this bucking bronc. Through the 420-foot slalom, the fastest run we made (without hitting the cones or spinning out) is 7.01 seconds, which translates to 40.9 mph. 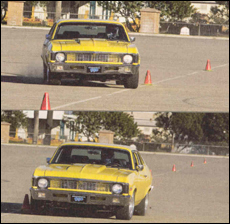 On the skid pad, we ran the Nova clockwise and counterclockwise (the skid pad has a circumference of 628 feet and a radius of 100 feet), and the average time of both runs was 12.9 seconds, which translates to 0.74 g. When it came to braking, we tested the Nova from 60 mph to O. The best stopping distance was 174 feet. The more we tested, the hotter the drums got, and the longer our distances became. 22. One last fun photo. Here we are spinning out the poor old dog in the slalom course. Sometimes this job is just too much fun. 23. The newly built Nova gave us some great comparison numbers to chew on. 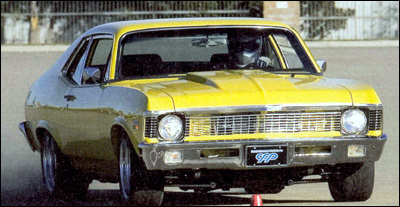 In the 420-foot slalom, the Nova ran a personal best of 6.19 seconds through the cones. That translates to 46.9 mph-6 mph faster than stock. In the skid pad the Nova managed 0.94 g, compared to 0.74 g in its stock state. When it came to braking, we have a record test here. The best stopping distance we pulled from the Nova with its new Wilwood brakes was 112 feet. Compare that to the 174-foot distance in its stock form. Now here is something to think about: When the Nova stopped at its new 112-foot mark, the old stock Nova was still traveling at approximately 23-24 mph. That's fast enough to cause some serious damage. In our history of vehicle testing, we have never had a car stop in this short of a distance.